NCSCE welcomes the opportunity to recognize the work of the many people who encourage greater civic engagement and the improvement of science, technology, engineering, and mathematics education for all students. To this end, NCSCE has created programs and awards to honor educators, administrators, students, and members of the public. The William E. Bennett Award for Extraordinary Contributions to Citizen Science was established by NCSCE and named in honor of its first recipient for his lifetime contributions to citizen science. The first award was presented to its namesake at a ceremony on Capitol Hill on March 31, 2009. The William E. Bennett Award is given annually to an individual and a team whose SENCER and other related activities have made exemplary and extraordinary contributions to citizen science. The 2018 William E. Bennett award individual awardee was Matthew Fisher of Saint Vincent College, and this year’s team awardee was Texas Woman’s University. Read more. In 2017, the Bennett Award was given to Dr. Katayoun Chamany. A longtime participant, contributor, and faculty leader in SENCER programs, Katayoun has developed educational materials integrating social justice perspectives into biology, providing more highly-contextualized biology education to students. Please click here to learn more about her work. Dr. Garon Smith and Dr. Judith Iriarte-Gross accept 2016 Bennett Awards at SSI 2016. The 2016 awards honored two longtime members of the SENCER community, Drs. Judith Iriarte-Gross of Middle Tennessee State University (MTSU), and Garon Smith, recently retired from the University of Montana. Both have made lasting impacts on their universities, communities, students, and colleagues with their dedication to improving STEM education and engaging students. Awards were announced during the 2016 SENCER Summer Institute at Roosevelt University in Chicago, IL. To read more about Judith and Garon, please click here. The 2015 individual and team honorees provide inspirational examples of local and global impacts. Sherryl Broverman’s (pictured) remarkable achievements in both increasing attention to HIV disease in the Duke curriculum and advancing education of girls in Kenya through the founding of a secondary school emerged directly from her work with the SENCER project, and she has both inspired our community and served as model of rigorous science education through global engagement and service. Drs. Winnie Yu, James Tait, Vince Breslin, Terese Gemme, Terri Bennett, Susan Cusato of Southern Connecticut State University received the team award. Since 2004, 32 faculty members from Southern Connecticut State University (SCSU), encompassing 12 departments and three of its schools, have both incorporated SENCER ideals into existing courses and programs as well as created new ones. To read more about Sherryl Broverman and the SCSU team, please click here. Three Bennett Awards were issued in 2014, one to a team and two to individuals. Dr. Gary Booth of Brigham Young University and Congressman Rush Holt, former Representative of the 12th District of New Jersey (pictured, right), were honored with the individual awards. The team award went to the United States Military Academy at West Point’s Core Interdisciplinary Team. Awards were presented to Dr. Booth and the West Point team during the 2014 SENCER Summer Institute at the University of North Carolina Asheville. Representative Holt was presented with his award during the 2014 Washington Symposium and Capitol Hill Poster Session. To read about Dr. Booth and the Core Interdisciplinary Team, click here. Click here to read about Representative Holt. The 2013 honorees were Monica Devanas of Rutgers University (individual award) and faculty from the University of North Carolina Asheville (team): Ellen Bailey, David Clarke, Amy Lanou, Leah Matthews, Karin Peterson, Jason Wingert, and Sally Wasileski. The awards were distributed during the 2013 SENCER Summer Institute at Santa Clara University. To read about Monica Devanas, please click here. To read more about the University of North Carolina Asheville team, please click here. In 2012, awards were given to a team of faculty from Roosevelt University and Dr. Marion Field Fass (pictured left with William E. Bennett) of Beloit College. Click here to learn more about the award-winning work done by the Roosevelt University team and Dr. Field Fass. In 2011, awards were given to both an individual and a team. The individual honored was Dr. Catherine Hurt Middlecamp, the director of the Chemistry Learning Center and the chair of the Integrated Liberal Studies Program at the University of Wisconsin-Madison. Cathy has been with SENCER since its inception in 2000, serving as a senior associate, a member of the National Fellowship Board, and a member of the board of advisers for GLISTEN. With Omie Baldwin, she developed the 2004 SENCER Model course, Chemistry and Ethnicity: Uranium and American Indians. In 2007, Cathy was appointed as the editor-in-chief of Chemistry in Context, a project of the American Chemical Society that teaches chemistry in the context of real-world issues. As a member of the author team, she has been the lead author for the chapters on air quality, acid rain, ozone depletion, nuclear energy, and sustainability. In addition, Cathy has received numerous teaching awards, including the University of Wisconsin System-wide Underkofler Award for Excellence in Teaching in 2004. She is a fellow of the Association for Women in AAAS, and in the inaugural class of fellows at the American Chemical Society. Dr. Jim Speer and the SENCER Student Leadership Team of Indiana State University have done tremendous work on Indiana State’s campus. The team includes Lauren Adams, M. Ross Alexander, Dustin Blaszcyk, Chase DuPont, Elise Hobbs, Adriahnna Lehman, Emily Pugh, Dorothy Rosene, Peter Rosene, and Julie Whitaker. Jim has encouraged student involvement in all aspects of applying the SENCER approach at Indiana State. Students were recruited and joined to share their expertise with the team, from science, technology, engineering, and mathematics to public relations, political science, and law. The students have accomplished much in just one year, and continue to provide a substantive contribution to Indiana State. SENCER efforts across campus, including the Leadership Team, have benefitted from support provided by the University’s strategic plan. The 2010 Bennett Award was given to a team of educators from Butler University who have been leaders on campus and in the SENCER community. Joseph Kirsch, professor of chemistry, accepted the award on behalf of his colleagues during the 2010 Capitol Hill Poster Session. His co-honorees were Donald Braid, Director of the Center for Citizenship and Community; Margaret Brabant, Professor of Political Science; and Robert Holm, Director of the Butler Institute for Research and Scholarship. Over the term of SENCER work, we have had the privilege of developing new programs spurred by needs or innovations by our community members. In this tradition, Hawai'i was designated the first 'SENCER State' in recognition of the inter-institutional collaborations and deep partnerships established to improve the quality of both formal and informal education. The ‘advanced representative’ model of participation at our annual SENCER Summer Institute was formed in response to individuals who needed to learn more about the project before persuading others at their institutions to invest time and funds in team-based efforts. Previously, team participation was the sole option for enrollment. The NCSCE William E. Bennett Award, which honors extraordinary contributions to citizen science, originally was given to one recipient each year, until community members suggested that we award the honor to one individual and one team each year in recognition of their equally compelling work. Hawaii team accepts new award recognizing exemplary regional collaborations during SSI 2015. We again find ourselves inspired to create a new award program that acknowledges and honors exemplary multi-institutional, regional, or statewide work around compelling civic issues. The need for this recognition program grows directly from the vibrant networks created as a result of a grant from the W.M. Keck Foundation that supported the development of a network of nodes and the ongoing work of the West and Southwest SENCER Centers for Innovation, supported by the National Science Foundation grant. The first recipient of this new award is a team from Hawai’i. While considering their work, it became clear that their actions and accomplishments seem best suited to be recognized by an honor that acknowledges quality of the inter-institutional collaborations and deep partnerships established to improve the quality of both formal and informal education. Hawai’i’s SENCER work is varied and broad and includes social and indigenous sciences with natural sciences foci. The state sponsors two distinct groups within its team of SENCER practitioners, the Native Hawaiian Initiative and Hui o Moku. The individuals recognized as part of the node include, from the University of Hawaiʻi at Mānoa (UHM): Dr. Denise Eby Konan, Dean of the College of Social Sciences and Professor of Economics; Dr. Ulla Hasager, Director of Civic Engagement for the College of Social Sciences and Ethnic Studies faculty; Dr. Hokulani Aikau, Director of General Education for UHM and Associate Professor of Indigenous and Hawaiian Politics in the Department of Political Science; Dr. Noelani Goodyear Kaʻōpua, Associate Professor of Indigenous and Hawaiian Politics in the Department of Political Science; Dr. Oceana Puananilei Francis, Assistant Professor in the Department of Civil and Environmental Engineering/Sea Grant College Program; Dr. Reza Ghorbani, Assistant Professor in Mechanical Engineering; Dr. Valli Kalei Kanuha, Professor, Department of Sociology. From Kapi’olani Community College (KCC): Dr. Robert Franco, Director of the Office for Institutional Effectiveness and Professor of Pacific Anthropology; and Dr. Wendy Kuntz, Assistant Professor of Biology and Ecology. From Windward Community College (WCC): Dr. David Krupp, Professor of Biological and Marine Sciences; Dr. Floyd McCoy, Professor of Geology and Oceanography; and Dr. Michelle Smith, Biology. And from University of Hawaiʻi at Hilo (UHH): Dr. Lisa Parr, Professor of Marine Science. Hui o Moku is inter-institutional and interdisciplinary, and uses activities such as service learning and community-based research to strengthen SENCERized transfer bridges from community colleges to universities for all students, especially Native Hawaiian and Pacific Islander youth. The Native Hawaiian Initiative links social and natural sciences to indigenous Hawaiian knowledge. The team is currently designing a two-year program that includes coursework, community-based research, engagement, and peer mentoring for Native Hawaiian undergraduate College of Social Science majors. Students and citizens assist with the upkeep of rain gardens and an ancient fishpond at WCC. Students conduct marine research and stewardship through WCC’s Pacific Center for Environmental Studies and the University of Hawai’i system-wide Marine Option Program. Students partner with The Nature Conservancy and Mālama Maunalua, two community groups, to act as citizen scientists and assist with invasive algae removal as part of KCC’s Ecology and the Environment lab. Students and community volunteers together receive archaeological field training at Kupopolo Heiau, one of the most significant ancestral places on O’ahu’s North Shore, through the UHM and Kamehameha Schools’ collaborative North Shore Field School. The field school identifies, documents, and investigates archaeological artifacts, features, and other cultural landscapes. Ka Holo Wa’a – Creating Oceanic Pathways: Walking the Stick of Our Ancestors, a UHM College of Social Sciences Program for Civic Engagement and Kānehūnāmoku Voyaging Academy partnership, has so far brought together over 700 people of all ages from both Hawaiian and Micronesian communities to share the knowledge of traditional canoe carving methods and navigation techniques. Students, as well as their family members and friends, participate in service-learning projects that integrate cultural, historic, and environmental learning through the Mālama i Nā Ahupua’a program. The program helps with restoration, maintenance, documentation, and oral history collection. Its participants gain knowledge about traditional Hawaiian use of land and water and understand why this knowledge is important today. Students create policy to address climate change impacts as part of Climate Change Science and Economics, a SENCER Model course offered at UHM. Students majoring in a range of various disciplines, many outside STEM, do research on their own sleep experiments through The Science of Sleep, a SENCER Model course offered at KCC. SENCER team members continue to be actively engaged in developing Sustainability policies for the University of Hawaiʻi System. The award was formally presented during the Leadership Dinner at the 2015 SENCER Summer Institute, hosted by Worcester Polytechnic Institute in Massachusetts. It was received by members of the SENCER Hawaiʻi Team, which represents the growing statewide network and collaboration including Native Hawaiian Student Services (NHSS) and University of Hawaiʻi West Oʻahu (UHWO). The picture shows (from the left): Prof. Mike Ross (KCC), Dir. Sherry Proper (UHWO), Dr. Robert Franco (KCC), Dr. Thomas Giambelluca (UHM); Dr. Ulla Hasager (UHM), Dr. Darren Lerner (UHM/SeaGrant), Dr. Eomaillani Kukahiko (UHM/NHSS), Prof. Patricia Buskirk (UHM), Dr. Esther Widiasih (UHWO), Dr. Michael Hayes (UHWO), Dr. Albie Miles (UHWO), and Dr. Wendy Kuntz (KCC). “I would like to acknowledge the support from SENCER leaders, NCSCE staff, SENCER Co-PI and SCI-West Co-Director Amy Shachter, and the house call team in particular, who spent ten intensive days conducting site visits to Hawaiian campuses discussing SENCER and NCSCE resources and methods, and sharing SENCER teaching strategies they’ve implemented on their own campuses,” says Dr. Ulla Hasager, whose work and organization was instrumental in facilitating the sharing of knowledge accomplished during the visit. The Hawai’i SENCER team was also honored as part of the 2015 NCSCE Washington Symposium and SENCER-ISE National Meeting. 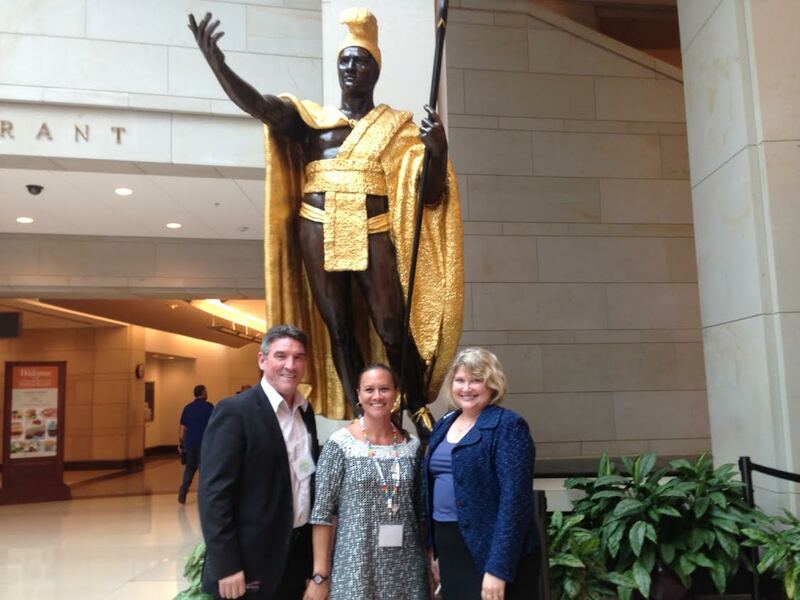 Dr. Franco gave remarks about collaborative work being done in Hawai’i during the Capitol Hill Poster Session. In future years, we will initiate a call for nominations in the late fall/early winter for consideration for the award. Packages will include a letter of nomination from a person(s) outside of the team that describes the quality of a given group’s efforts, two additional supporting letters, and biosketches or CVs for each member of the team. Each application will be reviewed by a panel, and the selected team will be announced at the annual Summer Institute. The Leadership Fellows program offers educators and administrators the opportunity for greater involvement in the our initiatives and allows us to recognize the hard work of those who have developed strong programs. The newly revised Fellows program will be an intensive, one-year mentoring experience built around a specific goal that the prospective Leadership Fellow (the mentee) determines in his/her application. Mentors, who will be designated Senior Fellows, will commit to working with a Leadership Fellow to help her/him meet the goal. For more information on the Leadership Fellows program, please visit the program page. Expand the sections below for guidelines on being recognized with a William E. Bennett Award or Leadership Fellow appointment. Individuals and teams are eligible to be considered for the Bennett Awards. To nominate an individual or a team, please write letter giving your reasons for making the nomination in sufficient detail to enable the selection committee to assess the nominee’s contributions to citizen science. A CV or bio-sketch for the nominated individual or, in the case of team nominations, a CV for each person to be named in association with the team effort, should be included. No more than two supporting letters may be submitted. Such letters are not required. Your nomination letter (and supporting materials) should be addressed to “The Wm. E. Bennett Award Committee” and e-mailed as a PDF to sencer@sencer.net. Recipients of the Bennett Award will be recognized at NCSCE national symposia for their achievements. The next deadline for Bennett Award nominations is June 2, 2016. Applications to the Fellows program are currently being accepted. The application deadline is January 31, 2018. Please visit the Leadership Fellows program page for more information on the program and application process. Apply to become a Leadership Fellow! Apply to become a Senior Fellow!